Coloardo is RV-vacation country. A love of road trips, roughin’ it with loved ones or that perfect high-country sunset — whatever motivates you to get behind the wheel of your own RV, take it to the road and seek out Colorado’s most inspiring natural locations for your RVing adventure. Route Highlights: This road trip unveils plenty of stops for only-in-Colorado adventures. Warm your legs up with a bike ride outside historic Leadville along the 11-mile paved Mineral Belt Trail. Drive south and log some miles on the Collegiate Peaks Scenic Byway, pulling over for breathtaking hiking under the nation’s highest concentration of 14,000-foot peaks. No summer would be complete without a trip to Buena Vista to raft the raging Arkansas River. Park at one of the area’s many RV-ready campsites and rest up for an exhilarating drive to Great Sand Dunes National Park and Preserve. Come prepared to make the rewarding, calf-burning hike to the top of the tallest dunes in North America. Route Highlights: Cruise up Lookout Mountain in Golden and pay homage to one of the Old West’s most intriguing characters at the Buffalo Bill Museum and Grave. Wind your way to the Gold Rush towns of Central City and Black Hawk and try your luck in the numerous gambling saloons. Dotted with working dude and guest ranches, nearby Grand County serves up a true Wild West experience. Sign up for a ranch visit and partake in hayrides, cattle chores and campfire cooking. Complete your journey on the dusty trail to tucked-away Steamboat Springs. Watch horses gallop in the Yampa River Valley and the sun dip behind a panorama of peaks. Be sure to enjoy the handful of taverns and home cookin’ joints thriving in this classic cowboy town. Route Highlights: Begin this tour of amazing natural wonders in Colorado Springs at the stunning Garden of the Gods, where you’ll walk among ancient red-sandstone formations. Head west to the Royal Gorge Bridge & Park and gaze down into one of Colorado’s deepest canyons while standing on one of the highest suspension bridges in the world. Continuing west, a stop at the Salida Hot Springs Aquatic Center pool reveals the history behind the piped-in healing waters of neighboring Poncha Springs. The final drive to the box canyon of Telluride is a destination in itself. You’ll want to set aside some time to explore the dramatic San Juan Mountains and hike to cascading Bridal Veil Falls. 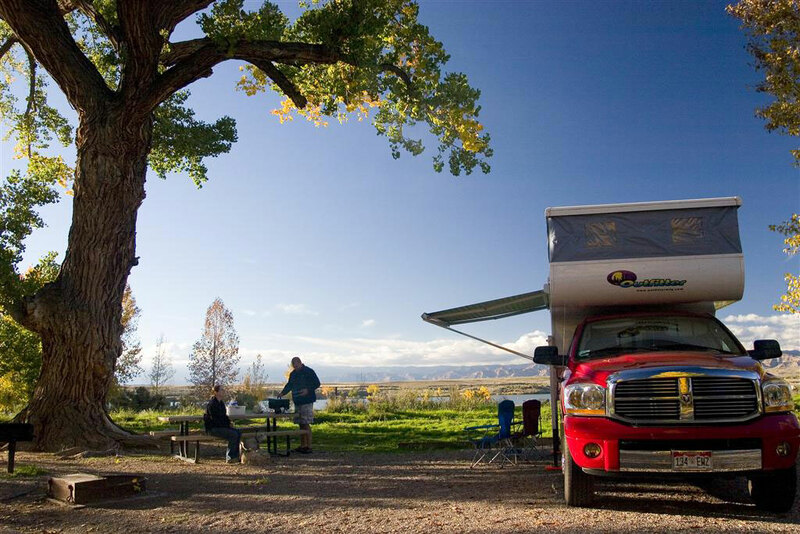 Check out Unforgettable RV Campgrounds in Colorado and our Colorado RV park listings. Photo courtesy of Colorado Parks & Wildlife.